It can be hard to make learning about the night sky student-centered, but that’s what this activity does: students trade and discuss cards, then take charge of finding and pointing out the different objects. When an object is found, the instructor may share some interesting information to feed students’ curiosity, but the primary focus is on students finding, wondering about, and discussing different objects. 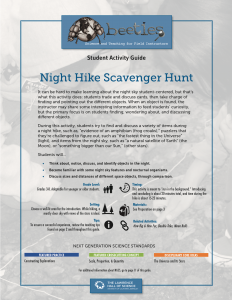 During this activity, students try to find and discuss a variety of items during a night hike, such as, “evidence of an amphibian (frog croaks),” puzzlers that they’re challenged to figure out, such as “the fastest thing in the Universe” (light), and items from the night sky, such as “a natural satellite of Earth” (the Moon), or “something bigger than our Sun,” (other stars). Think about, notice, discuss, and identify objects in the night. Become familiar with some night sky features and nocturnal organisms. Discuss sizes and distances of different space objects, through comparison.